Actisound technology uses Intense Therapeutic Ultrasound to treat musculoskeletal injuries. 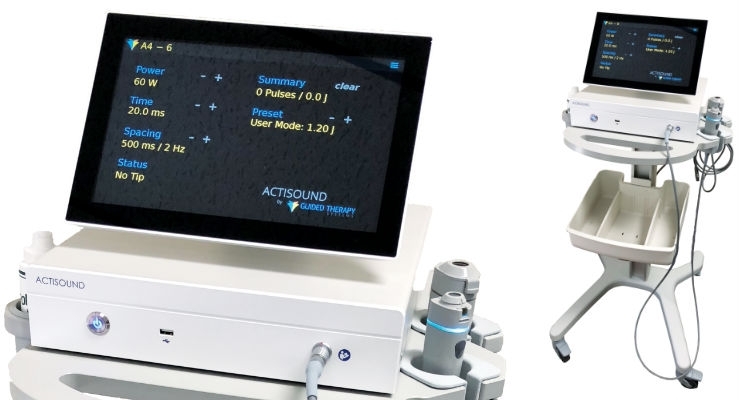 Guided Therapy Systems, a provider of ultrasonic therapy and imaging technologies, has received CE mark approval via its development partner and manufacturer, Ardent Sound Inc., for its Intense Therapeutic Ultrasound (ITU) Actisound device to be used by medical professionals across the UK and Europe. Actisound Intense Therapeutic Ultrasound acts like an invisible scalpel—working beneath the surface of the skin—precisely delivering small thermal ablations to tendons, ligaments, and other soft tissue to stimulate collagen growth and the regeneration of connective tissue. Unlike other energy sources, such as laser, microwave, and radio frequency, ultrasound is the only energy source that can penetrate safely through intervening tissue and be focused to a specific point and shape within the body. This allows physicians the unique ability to deliver treatments directly at the point of injury—up to depths of 15 mm—without ever opening the patient. Currently, Actisound is the only non-invasive, ablative treatment for pain relief associated with the repair of musculoskeletal injuries available to medical professionals. Common therapies such as NSAIDS and steroid injections only temporarily reduce pain without addressing the underlying injury. Often procedures like shockwave and minimally invasive procedures including tenotomy, PRP, and stem cell injections can be very costly and painful. Traditional surgeries are even more expensive, requiring longer recovery and “down time” while exposing patients to a number of complications associated with these invasive procedures. With Actisound, no cutting or painful injections are required, and the treatment can be delivered right in the physician’s office. Actisound is affordable and fast, requiring only one or two, 10-minute treatments typically resulting in reduced pain and inflammation within 48-72 hours and soft tissue repair within 4-12 weeks. Three multi-center clinical studies1 have shown that more than 80 percent of chronic patients (with length of persisting pain averaging 15.7 months) enjoyed a significant reduction in pain combined with increased function and mobility, compared to traditional methods. Actisound is now available for clinical and professional use by, but not limited to orthopedic surgeons, podiatrists, sports medicine physicians, physical medicine and rehabilitation physicians, rheumatologists, and primary care physicians across the UK and Europe.